The major italian companies in Qatar met to celebrate the estabilishment of the Italian Chamber of Commerce in Qatar (IBCQ). 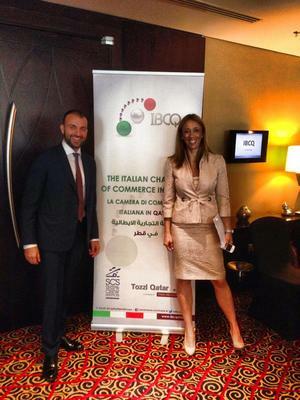 The event held in the presence Italian Ambassador to Qatar, Guido de Sanctis; Qatar’s Ambassador to Italy, Abdullah Eid Al Sulait, was attended by top qatari business leaders including, of course, IBCQ President, Palma Libotte and CEO of IBS ITALIA, Alessio Gambino, also IBCQ Italy Desk Manager. Palma Libotte presented the chamber’s activities, such as: B2B meetings, trade missions, exhibitions, networking events. Libotte said also that the IBCQ was planning to take a small delegation of Qatari entrepreneurs to Italy and visit a variety of production sites. She also annunced to launch a new website named “Italian Products 4 Qatar”, a site that would serve as a product finder that will showcase products of Italian companies in the Qatari market. There has been a 15% increase in the total trade volume between Qatar and Italy last year. However, italian companies are not sufficiently aggressive when approaching the qatari market. For this reason the chamber will be diligent in formulating a screening process to assist Italian and Qatari companies in doing business.